After, being a certified nursing assistant, you might often get the situation, where you have to take responsibility of the patient, who is facing trouble in moving the body parts. To maintain the physical movement of a patient, certified nursing professionals have to take into the use of various equipments and methods. This aids the patient in maintaining the physical activity. Transfer belt is one of such equipment, which helps the patient to move from one point to another. 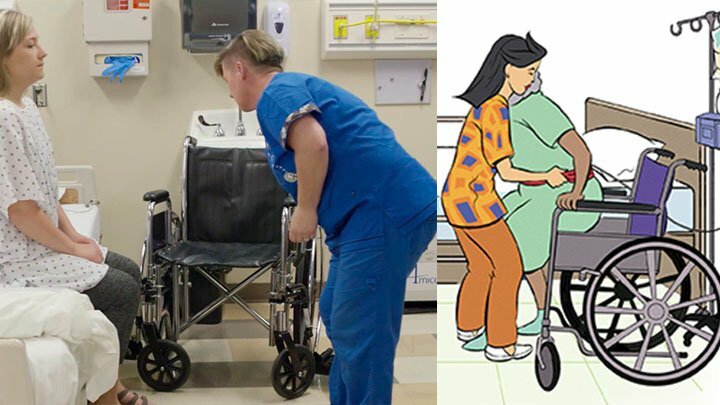 CNAs also make use of transfer belt to shift the patient from bed to the wheel chair, so that the patient shouldn’t fall and their physical safety is maintained all the time. The device is approximately 60 inches lengthy and about 2 inches broad. The patients have to put it on their waist, which makes it easier for the care taker or the nurse aide, to carry the patient with the help of this device, conveniently. Before beginning with the process, you must greet the patient politely with a smile on the face. This will support you to create a comfort level with them, and they can cooperate with you properly. Give a brief introduction of yours and make clear that you are going to relocate that person from bed to a wheelchair by using the transfer belt. Initially, take the wheelchair closer to the bed of the patient. Now, help the patient to be seated at the rim of the bed. Before starting the transfer method, always check that the wheelchair is locked. Always, keep this in mind all the factors that can make the patient fall anyhow. It is essential to remove the foot mattresses that can come in the way while transferring the patient. Give the patient non slippery footwear to wear, before starting the shifting procedure. Assist the patient to sit properly and give some time to adjust them the change made in their sitting position. Now, you have to put on the transfer belt on the patient’s waist in a safe and sound way. Always, take care that the belt should not be too tight to damage the patient’s skin or hamper their breathings or the blood flow. It shouldn’t be too free or loose to become problematic for the patient. Moreover, be careful about the belt, as it also should not come in direct touch with the patient’s skin because it can rip it harshly. Support the patient to keep the foot even on the ground, prior to the transferring process. The seat or the front part of the chair must be placed alongside of the bed. If you have to do a pivotal transfer of the patient into the wheel chair, keep the chair very closely to the bed. It is always good to fix on an indication before doing the transfer of the patient, for example, counting to 3. Explain the patient clearly that while gaining the signal, he/she have to start getting up from their seats. This will facilitate you to coordinate with the patient properly, and the transferring process will be done in a healthier way. Stand at the front of the patient, you have to transfer. Grasp the transfer belt tightly from both the sides, keeping your hands in rising position. Also, simultaneously give support to the legs of the patient. This helps the patient to keep the legs in the stable position while standing up. After giving the sign, when you see that the patient is striving to stand up, you make sure that you have clutched the belt strongly by pulling the patient in the upside direction. Once, you have successfully transferred the patient on the wheelchair, now it’s time to unlock and take away the transfer belt from the patient’s waist carefully. While, doing this, you need to be quite gentle with your hands. After the completion of this process, when you have to leave the patient, ask him/her whether he/she is comfortable or not. If not, then try to get them into a restful position. Also, be certain that the calling button should be within the reach of the patient. At the time of helping the patient to get up, you must also essentially ensure that the balance of your own body is maintained correctly. Make sure that the back of the patient should be towards the wheelchair. Assist the patient to sit down gently into the seat of the wheelchair. Help the patient to position his/her hips in the contact of the wheelchair’s seat. After shifting the patient, give the footrest back to keep the feet to relax on it. What does the auditor observe, when you execute this Skill? While, performing this skill, the examiner will monitor each and every step of yours attentively. Below, is the list of some valuable things you must keep in mind while conducting this skill. 1. How do you start this activity? Tip- To begin with procedure, it is essential to wash your hands properly and then, perform every essential thing in the beginning, like greeting humbly to the patient and make them relax. 2. How do you apply the transfer belt on the patient? Tip- Apply the transfer belt firmly to the patient. 3. What do you do before transferring the patient from the bed? Tip- Before starting this procedure, locking the wheelchair and the bed is significant. 4. What do you do with the patent’s bed? Tip- Bring the bed of the patient to the level, where he/she can place their foot appropriately on the floor to avoid the risk of slipping or falling. 5. What do you do after the process gets over? Tip- Make sure, you have unlocked the wheelchair and separated the transfer belt, once the transferring is done. 6. Do you remember what you require to do with the patent’s shoes before the process starts? Tip- Always, remember to lend a hand to the patient to put the shoes on, after transferring. 7. What standard protection measures you have taken during the process? Tip- Throughout the process, you have to take care of using proper infection control techniques to maintain the standard precautionary criteria. 8. How do you make the patient feel throughout this process? Tip- You also have to be certain of the fact that the patient is secure and comfortable while the process is taking place. 9. Do you care about maintaining the rights of patients? Tip- It is also your responsibility to ascertain that the patient’s rights are maintained, and he/she shouldn’t be complainant of that. 10. Do you maintain the safety of the patient? Tip- Safety is a priority for the patients; so make sure they should be transferred safely during this whole procedure. The link given below will make clear about the techniques of how the transfer of a Patient from Bed to Wheelchair with the use of a Transfer Belt is done. This will help to those, who want to perform these CNA skills in the CNA skill examination.